Fashion your own world full of exotic animals and a variety of landscapes. Keep a sharp eye on the clock and the other players, because everything happens simultaneously! Jump out at the right time and reap a couple more bonus points. 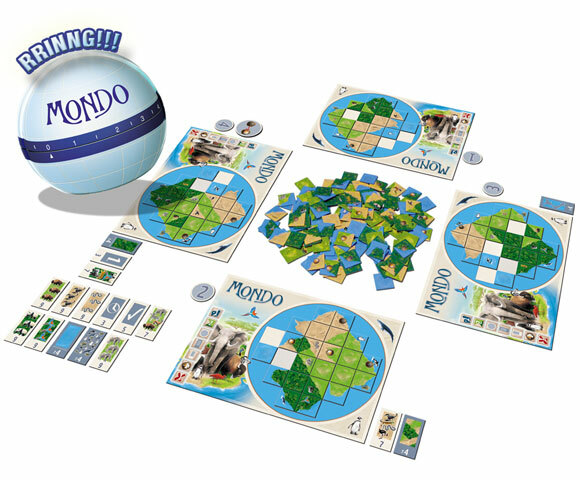 Mondo is a tile game with particularly simple rules. The varying game system, with its three levels of difficulty, is intended equally for experienced and inexperienced players. And if you’ve got no one to play with, you can play Mondo solitaire! Mondo is a puzzle game, players compete against each other and against the clock to make the most beautifull world with the most animals and the least active vulcanoes. You can score more or less points with bonus objectives. A big pile of tiles and 4 game boards. The art is nothing special but functional. The Mondo clock is a mechanical egg timer. The rules are clear, the game is easy to teach. Mondo is a solitaire puzzle that is played simultaneously, so there is not much interaction (but some). If you like puzzles, you will like this game. But even if you don’t, you might still like the play Mondo with your family. Because of the theme this game appeals to children, but it can still be a challenge for adults. You can set the difficulty of the game with the variable rules and by adjusting the time pressure. The egg timer can break rather easily. The game can get boring after some plays (depending on your mood), although it plays very quick. A nice quick puzzle game for families. Mondo is a serious brain burner. Even on beginner mode. You have to create an island by placing tiles on a board. You score points for creating enclosed areas (sand, forest, grass, etc) and score additional points if you can place animals within those areas. You lose points for volcanoes. All of that sounds simple, and it is.. but it gets INSANE when you throw a community pile of tiles in the center of the table and start the timer. Everyone is grabbing at once and trying to make it all work. When you’re down to a minute, your brain will do things that you don’t want it to do. As crazy as it sounds, Mondo is a lot of fun. This was a wonderful game to pick up. The instructions are easy to understand and straight forward, starting you off with the easiest level of play and then proceeding from there, building new elements and components into the base level of game play. I really appreciated the notable difference in this game as it is not turned based but time based. Start the clock and all the players go to their work until the time runs out. Then points are counted and rounds are repeated. Overall, I would say that this is a wonderful game that is family friendly fits the age range it advertises well. It encourages creative thinking and problem solving that is challenging for all ages. Adding the more difficult levels makes the replay value of this game high. I highly recommend it! Add a Review for "Mondo"